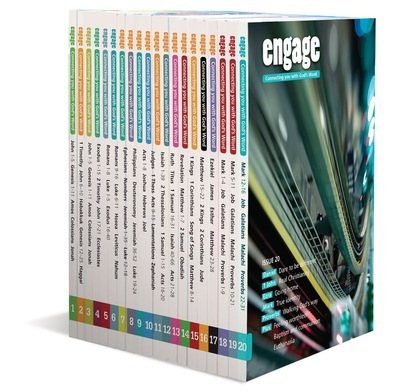 Engage is now available as a collection of 20 issues meaning you buy an entire library of Bible study aids designed to help young people understand and apply the WHOLE Bible. No chapter has been left unexplored, no subject left by the wayside. Engage helps young people connect to the source of life by encouraging them to handle, question and explore God's message. Coming from a reformed evangelical church I wasn't too sure about the content on maybe some doctrinal points that may see things differently.....if you know what I mean! However, I bought these Explore books with an open mind for a new Christian agreed 19. We go through the readings together mostly and have found them to be thought provoking and challenging and encouraging. It seems that any points I feared may be different are not covered but the author encouraged discussion with an older Christian our church leader. The layout of the book is fun, yet not irreverent, and the content is very good. Keep up the good work people, there is very little"good" material like this. the Engage notes have a helpful layout for each day. It's good that the notes tell you how to find your way round the bible at the start, for those who are unfamiliar. There is the right amount of depth in what is written for each bible passage.